by Bill Roberts – Primobolan Depot (methonolone enanthate) is often of interest to beginning steroid users and sometimes to experienced users. The first question to consider is really not pharmacological but one of economics. Usually for any given level of effect, Primobolan is an unusually expensive choice. And for most users, there is no unique benefit gained from its use. Accordingly, most experienced steroid users do not include it in their steroid cycle planning. That said, contrary to common opinion, Primobolan really is not a weak steroid, at least not on a milligram for milligram basis. It certainly is not weak in terms of anabolic effect versus side effects. It is a good performer in these regards. 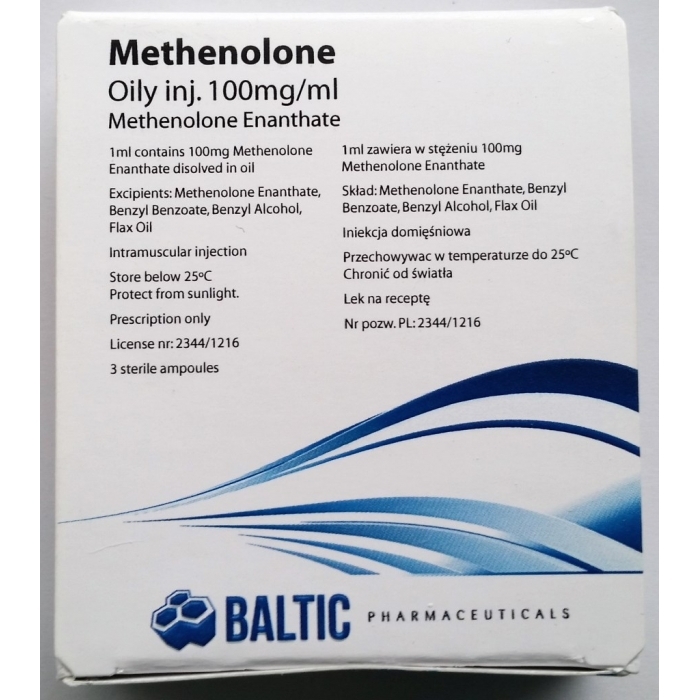 However, because the oil solubility of methenolone enanthate is only moderate, preparations are typically of only 100 mg/mL. This can give a psychological impression of not being as strong a compound as more concentrated products. Another likely reason for perceived weakness is that it is most often used for anabolic steroid cycles which deliberately are very conservative. For example, a classic beginner cycle is 400 mg/week Primobolan as the only steroid used. Of course, this does not give extreme gains. But then again neither does 400 mg/week testosterone! Primobolan presents an interesting situation with regard to stacking. Pharmacologically there is probably no difference in stacking behavior compared to Masteron, and certainly no important difference, but in practice those who wish to use Primobolan almost always are looking for mild stacking choices as well. For this reason, though Dianabol, Anadrol, or testosterone are effective stacking choices, they usually are not combined with Primobolan. For those wishing a mild steroid cycle, perhaps the best performance-enhancing drug to combine with Primobolan is not another anabolic steroid directly, but HCG at doses totalling approximately 1500 IU/week. This may be taken as, for example, 200 IU daily, 400 IU every other day, or 500 IU three times per week. This typically yields high-normal testosterone levels and maintains normal estrogen levels, aiding the effectiveness of Primobolan with relatively little added androgenic side effects. Such usage may be counted as comparable to injecting 100 mg/week testosterone, and so for example 500 mg/week Primobolan use combined with this amount of HCG may be considered comparable to 600 mg/week total usage of anabolic steroids. For those seeking to absolutely minimize effect on hair in skin, addition of this amount of HCG may be excessive. Because more moderate testosterone levels are desirable in such instances, the HCG dose should be reduced to a total of only 700-750 IU/week. Further, the amount of Primobolan should be kept to no more than 400 mg/week, as Primobolan itself also has effect on hair and skin. An alternate situation, not commonly seen, is where a cycle is trenbolone-based but rather than using a relatively high dose of trenbolone, the athlete limits the dose of that drug and uses another non-aromatizing injectable to support it. The combination can be milder in side effects while being still equally effective, at least in terms of anabolism, to higher-dose trenbolone. While Masteron is a more cost-effective choice for this purpose, Primobolan also will work well in this situation. The half-life of methenolone enanthate is probably about 5 days. As a result, Primobolan is most effectively used when injected at least twice per week. At the 400 mg/week usage level, post-cycle therapy (PCT) may be started only 5 days after the last injection, whereas at a higher level of usage such as 1000 mg/week, at least 10 days will be needed until recovery is likely to become possible. Methenolone is not subject to metabolism by the 5-alpha reductase enzyme (5AR), nor the aromatase enzyme. It therefore does not convert to DHT or to estradiol. These are among the advantages of the compound. However, its lack of conversion to DHT does not mean that it has no effect on the scalp: all anabolic steroids do. Briefly, Primobolan is an effective injectable anabolic steroid that usually is expensive for the anabolic effect achieved, is most commonly used for mild cycles, and in most – but not all – cases is an inefficient choice for more advanced cycles.